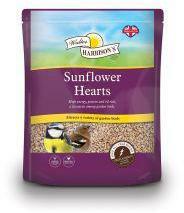 Walter Harrisons Sunflower hearts are packed with energy and essential oils. 100% husk free, meaning no waste and no mess. Attracts a variety of garden birds. Can be fed from a seed feeder, bird table or on the ground.